Did you know that a bottle of fine, well-aged tequila could cost as much as $1,800 or more? That’s not just because this traditional Mexican beverage continues to evolve and become more popular with connoisseurs. It’s also because this many-facetted drink is presented and sold in some of the world’s most creatively designed bottles. Once you see the exquisite artistry that goes into the making of these glass and ceramic master-pieces, you’ll realize they are worth every penny, and why they are so coveted by collectors the world over. Take for example a bottle of Milagro Romance Extra Anejo. The inner chambers of this crystal clear, hand-blown bottle are craftily suspended inside the unique outer bottle. There are three inner chambers that were once filled with 100% Blue Agave Select Barrel Reserve anejo tequila. Each chamber represents a year of the tequila’s aging to maturity. Some bottles depict ancient myths and gods, while others feature complex arrangements or folk tales. Artisanal handcrafted tequila bottles can contain gem stones, stories, paintings, clay; one of the pieces in the collection is a ceramic bull’s head that is surrounded by six matching shot glasses with miniature bull’s heads wrapped around each one. A Gran Centenario Azul Gran Reserva is one of the most beautiful bottles of tequila to come from Mexico, and extremely rare. Its elegant blue ceramic body presents a bronze angel playing a long trumpet in its hollowed out center. The bottle comes cradled in a handcrafted burlap material display case along with a booklet of information about the tequila. And the dazzling creativity doesn’t end with just beautiful bottle designs. Many of the fine tequila bottles, such as Jose Cuervo’s top of the line Reserva de la Familia collection, comes in meticulously crafted wooden boxes adorned with original graphics - artwork and limited production and distribution that makes these boxes collector’s items as well. 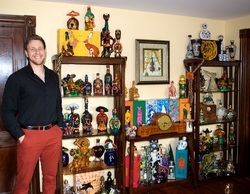 There are so many aspects to this unique art form of making fine tequila and packaging it in extremely imaginative ways, that Providence’s Alan Miller, Founder of “TequilaArt,” currently an online Museum, is now offering two-hour evening tasting tours twice a week, Monday and Thursday. Each tour features a tequila and food pairing at three of Federal Hill’s most acclaimed restaurants, as well as a guided tour of this historic area. To learn more about TequilaArt Museum, visit their website at TequilaArt.com.